Rarely are crawl spaces friendly environments for the people living above them. They are havens for mold, bacteria, odors, insects and rodents. Whether your crawl space has a dirt floor or concrete, wet or dry, we have a solution for you! Step 1. Check your gutter system. Make sure it’s not clogged; it needs to be the proper size for the slope of the roof. Drain spouts should be directed away from the house, and the grading should be sloped on an angle away from the house. Step 2. Crawl space vents should be properly installed. If they are at or below grade, rain or moisture on the top of the ground can run right through those vents, into your crawl space. In many instances it is best to keep crawl space vents sealed year round. In the summer when people often open them, damp air enters the crawl space and condenses on air conditioning ducts and water pipes. It essentially “rains” in the crawl space. It’s best to seal up those and don’t open them in the summer or any other time of the year. Step 3. Check your crawl space access doors. Doors at or near grade are vulnerable to rainwater. Pooling against them going under them into your crawl space. Step 4. Fixing the problem from the inside. Waterproofing the foundation from the inside using an interior Strip drain system, connecting to a sump station and covering the ground. 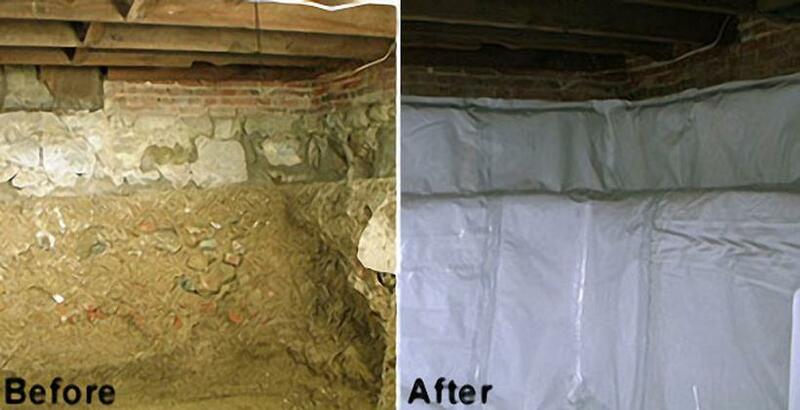 This is how healthy environments prevent moisture in crawl spaces for many homeowners.